Carole King (Abby Mueller) busts out in “Natural Woman.” Background: (L to R) Britney Coleman, Sarah Bockel and Ashley Blanchet. Photo by Joan Marcus. On Wednesday, the Hennepin Theatre Trust opened two related but very different affairs. One was the branding launch of WeDo™, the recently christened West Downtown Cultural District in Minneapolis. The other was opening night for Beautiful: The Carole King Musical, the latest touring Broadway show to come to roost in the Twin Cities. The story of WeDo has yet to unfold, but Beautiful certainly has a lovely sound. 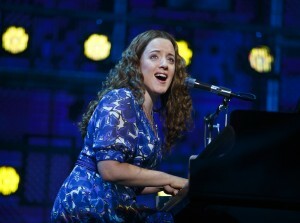 Abby Mueller as Carole King. Listening to Beautiful is rather like finding that the oldies radio station is playing all your favorite songs while you’re testing your new sound system. This jukebox musical is chock full of hit songs by the eponymous Carole King and her associates, including many that you probably didn’t know they wrote. Like last season’s Jersey Boys, the sheer quantity and variety of music down nostalgia’s way is quite impressive. Where this show edges out Jersey Boys (besides an array of verbal potshots at their state) is in its delivery of the songs as period production numbers. It’s not traditional for the supporting ensemble to overshadow the main cast, but the high octane deliveries from this chorus do just that for much of the show. Watching Dashaun Young, Paris Nix, Josh Dawson and Noah Ricketts go to town as The Drifters in “On Broadway” and “Some Kind of Wonderful” are some of the show’s most visceral pleasures. There are a lot of others, to be sure, but the big production numbers are with one or two exceptions the most interesting and compelling performances. Part of this backwards draw is the functional but ultimately no more than serviceable script by Douglas McGrath. There are no surprises awaiting in either the plot or the dialogue; the first time that you see a character on stage, their clothes and deportment tell you just about everything that they will say and do. This isn’t to say that Beautiful isn’t an enjoyable ride – Wednesday’s audience consumed it quite avidly – but aside from the music there’s not much that’s filling…and oh, that music! Songwriters Don Kirshner (Curt Bouril), Barry Mann (Ben Fankhauser), Carole King (Abby Mueller), and Cynthia Weil (Becky Gulsvig) in Beautiful. 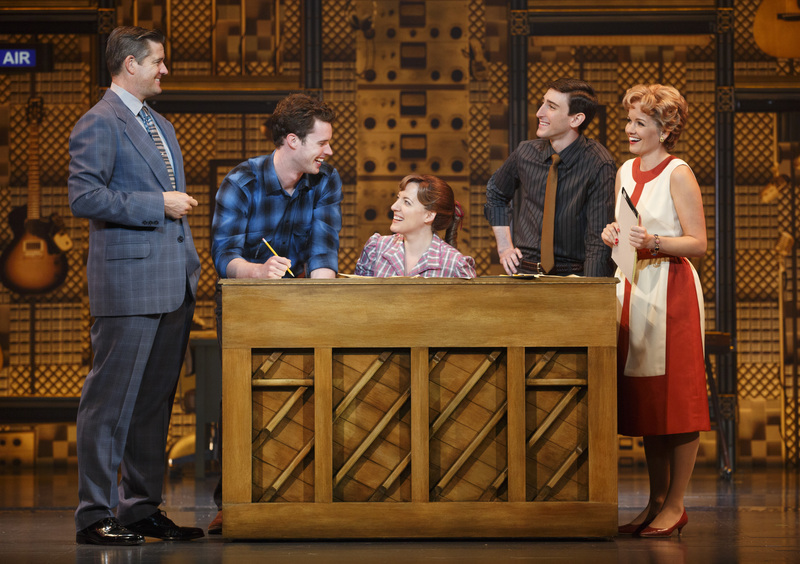 The core narrative of Beautiful follows the real-life composer-lyricist teams of Carole King and Gerry Goffin (the main couple, played by Abby Mueller and Liam Tobin) and Barry Mann and Cynthia Weil (Ben Fankhauser and Becky Gulsvig, respectively). In an interesting act of casting succession, Abby Mueller inherited the role in the touring production from her younger sister Jessie, who originated the role on Broadway and took home a Tony. That piece of trivia aside, Abby’s delivery stands in no one’s shadow; her show-starting and show-ending songs are the main rivals for the big production numbers on people’s list of favorites. Mann, Tobin, and Weil are good singers and pleasant to watch; it’s a shame the script didn’t give them much more to do besides introduce beautiful song after beautiful song. The talent is certainly there. The show Beautiful: The Carole King Musical plays at the Orpheum Theatre in Minneapolis now through Sunday, Nov. 29.